Off-roading in a safari vehicle down a bumpy, winding dirt road on the outskirts of Yala National Park, I wasn’t sure what to expect when we arrived. 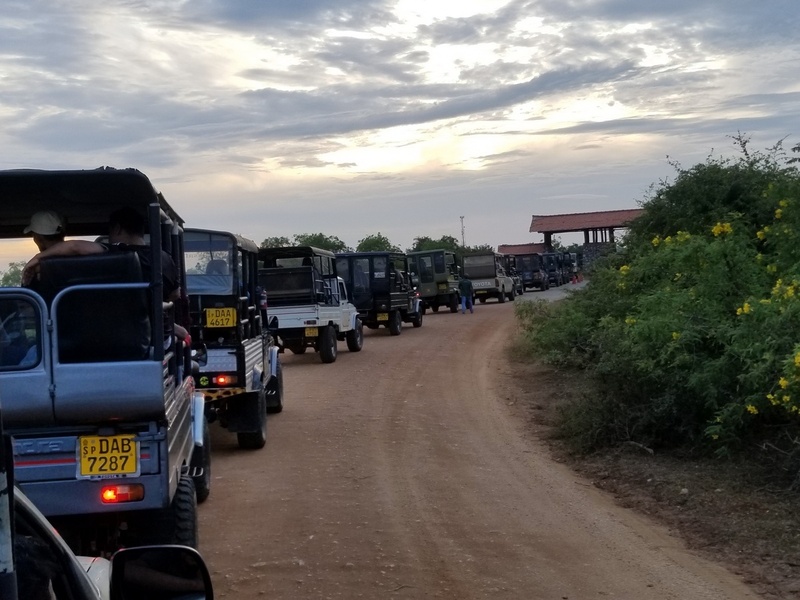 I was in Sri Lanka, heading to a safari camp, Yala Sanctuary. Half an hour earlier, we had been picked up from Tissamaharama by Dinesh. I wanted to be adventurous and stay in the park. I wanted to go camping, but not in a rustic way. 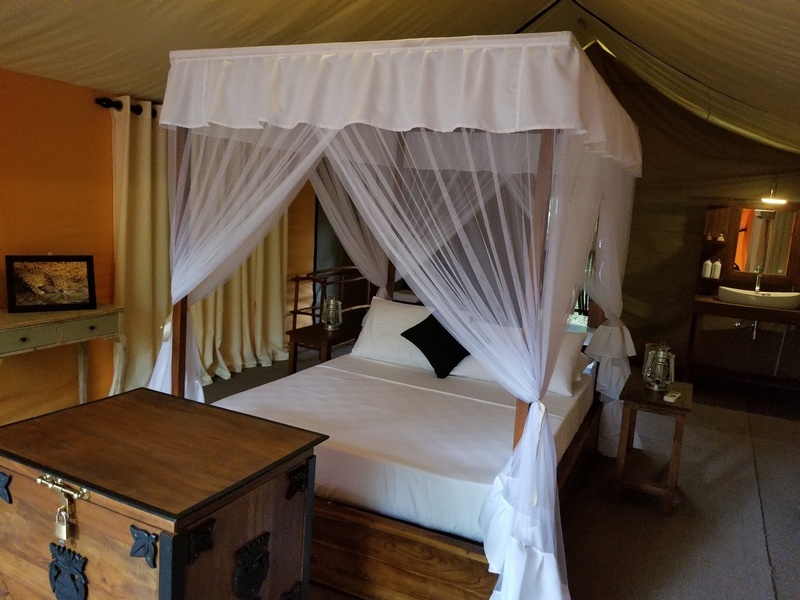 Glamping definitely fit the bill for me. 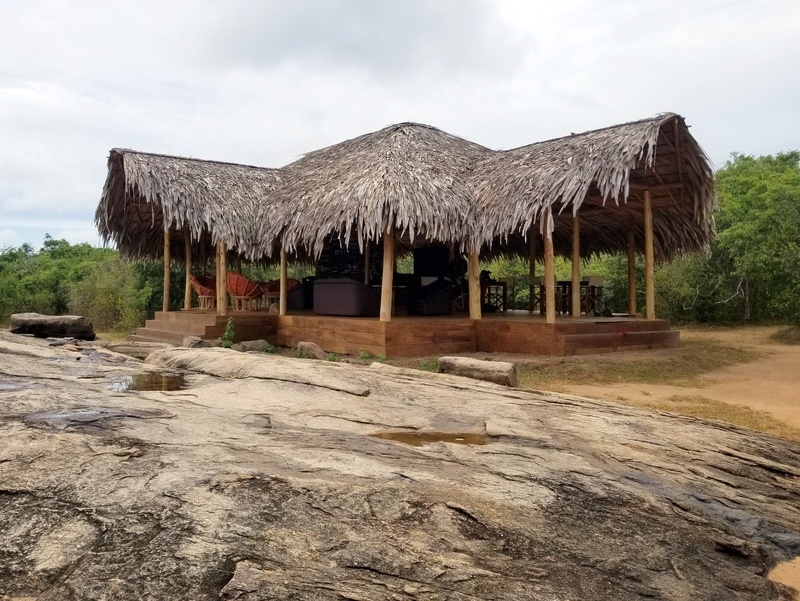 Yala Sanctuary is a new safari camp that opened in November. It looked magical, and I knew I wanted to experience it. 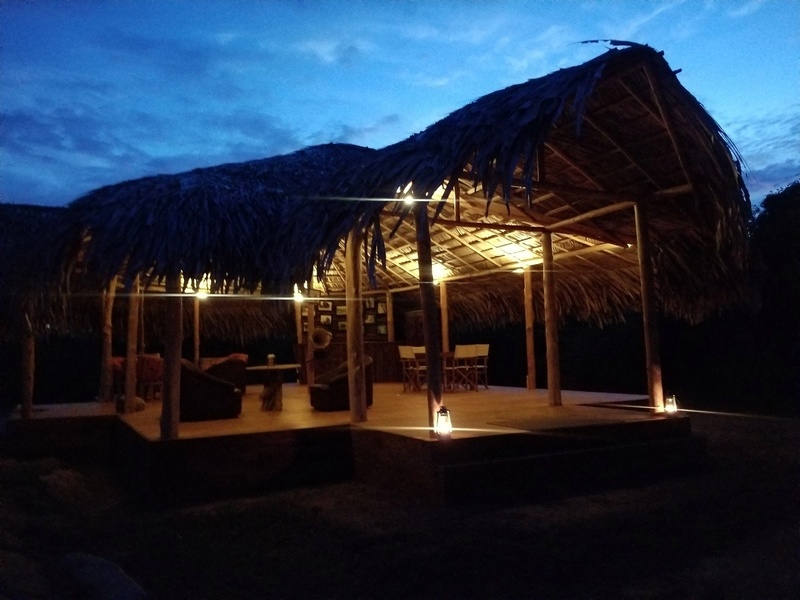 When we arrived at the camp, we were greeted with a roadway lined with tiki torches and a beautiful straw tent. 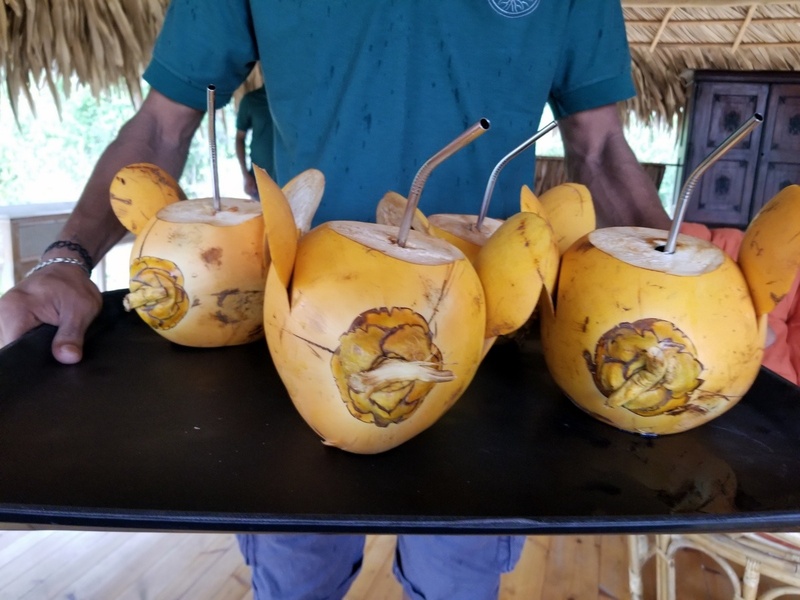 We were greeted with the cutest coconut drinks, and immediately felt like we were at home. 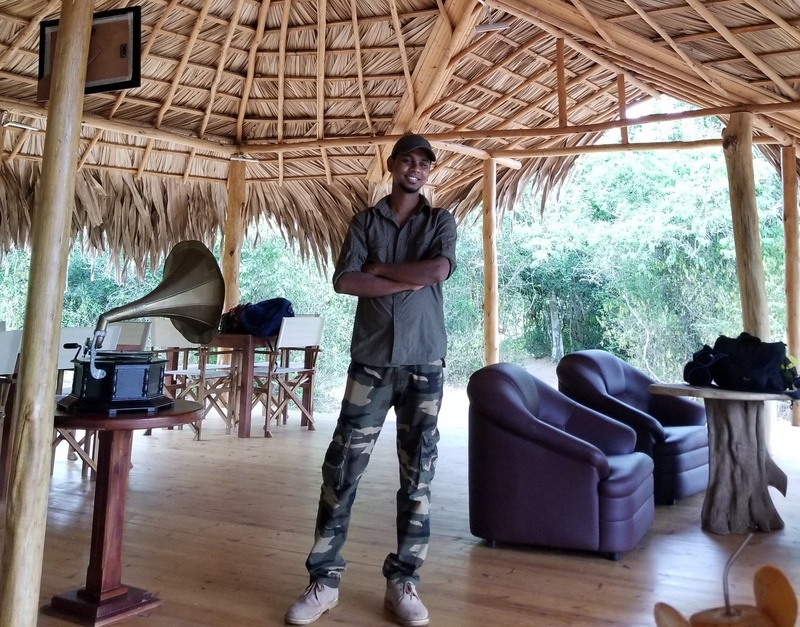 Before opening his own camp, Dinesh worked in the park as a guide and at other parks. He’s passionate about animals, and takes great pride in his work. 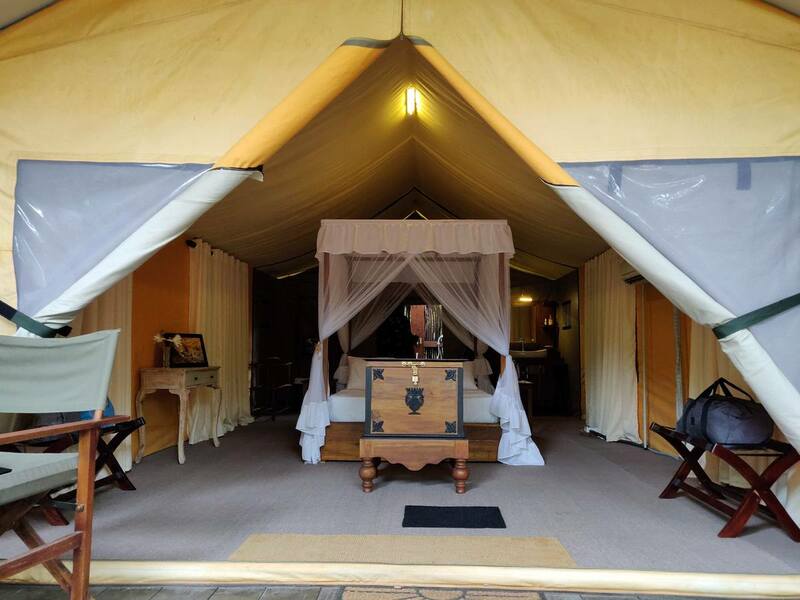 We were escorted to our safari tents to freshen up before lunch. We stayed in the “Leopard” tent. The moment we stepped into the tent, we were greeted by delicious A/C. There was a large, queen sized canopy bed covered with soft linens. Towels, bug spray, water bottles and toiletries were provided. At the back of of the tent, there was a door to the outdoor shower and the bathroom. 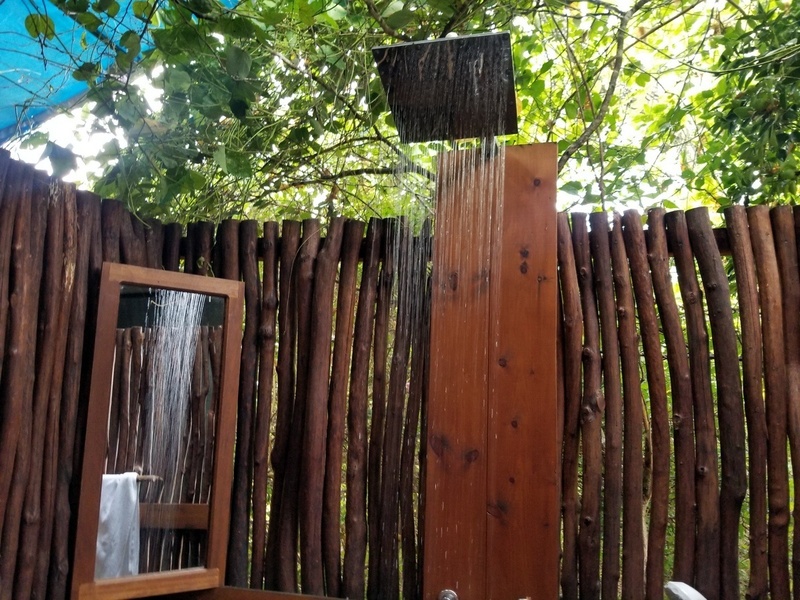 The outdoor shower was amazing! It was open air at the top, and enclosed with branches. After hanging out in the comfy chairs in front of our tent, we headed back to the main area for lunch. Lunch was delicious. Everything was freshly made on site. They have a filtered water tap, so there’s no need to use plastic water bottles. We had a traditional Sri Lanka lunch of red rice, white rice, dhal white curry, chicken curry, long bean curry, salad and papadum. Dinesh was very accommodating, and was able to bring out spicier dishes for my husband. For dessert, we had fresh curd and amazing honey. Now that we were full, it was time to head out on our first safari adventure. We hopped into the truck and headed to the entrance of Yala. 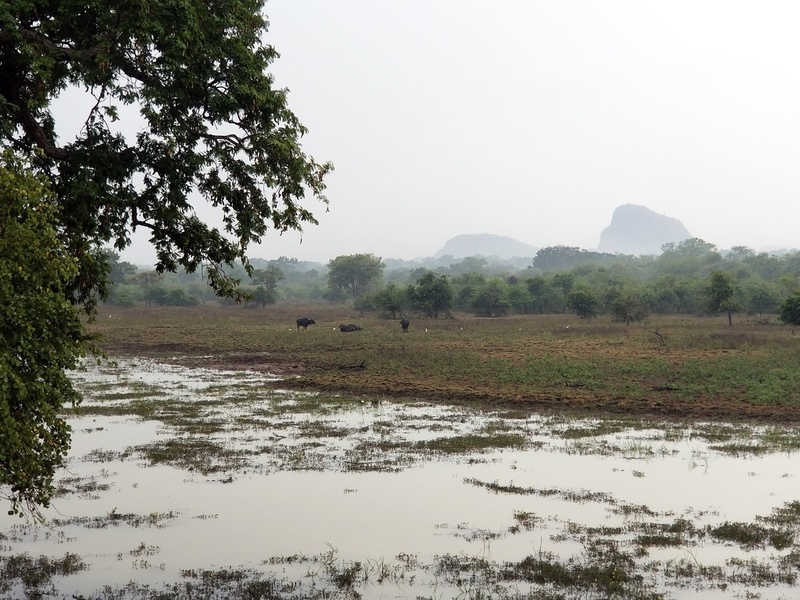 The first thing that you have to understand about Yala National Park is that it’s massive. The park is split into 5 blocks, and only two are open to visitors. 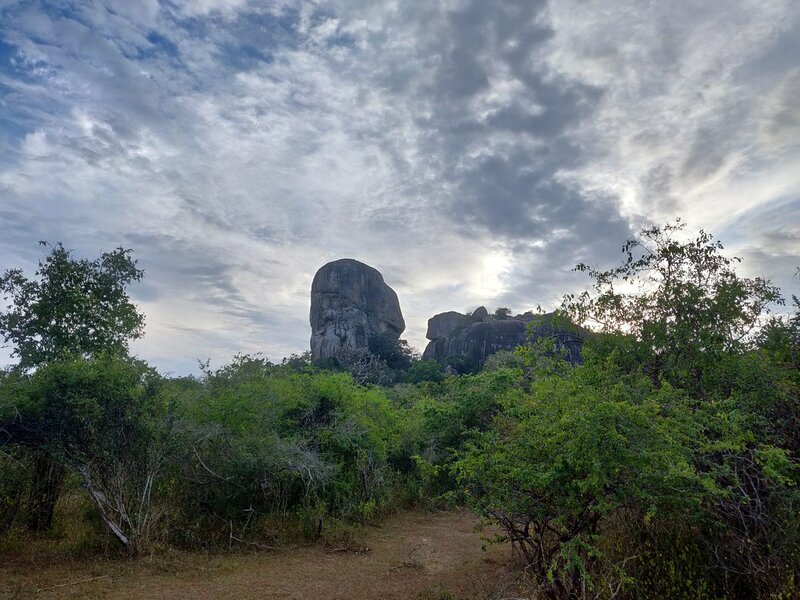 The other 130,000 hectares are protected for the many animals that call the park home. 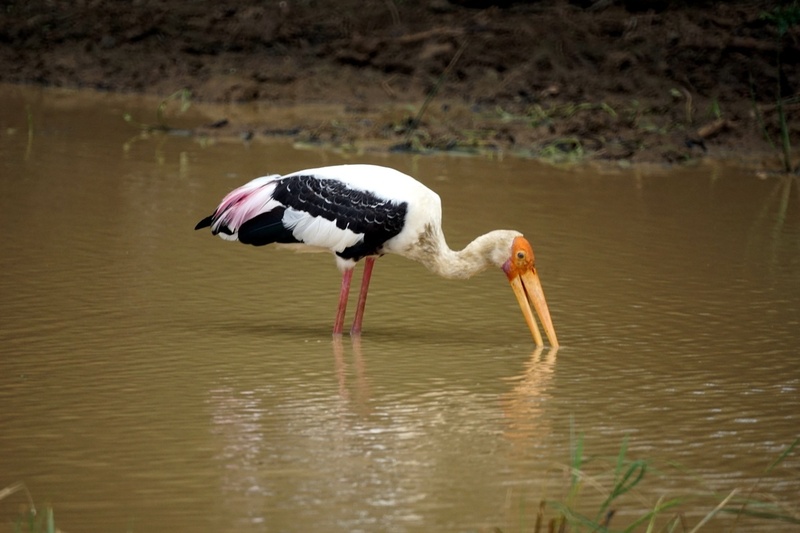 Yala has 44 mammals and 250 birds. 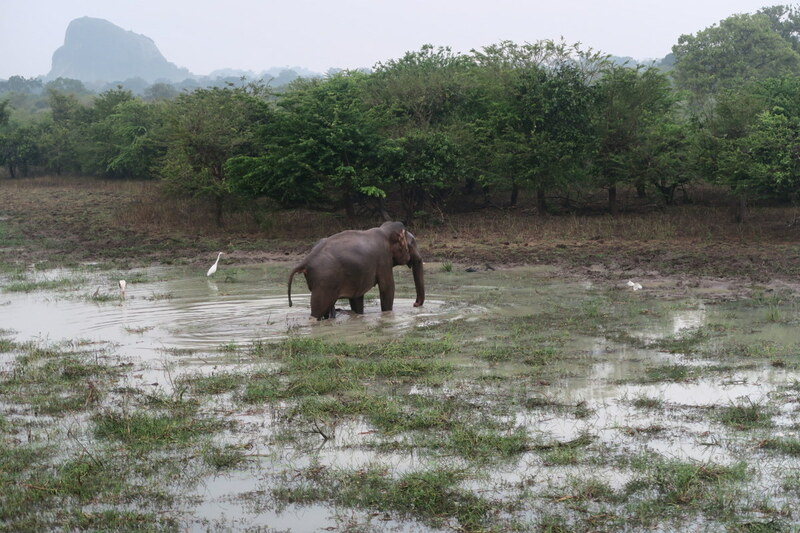 200 Asian elephants roam the park, as well as 45 leopards, 25 sloth bears, jackals, crocodiles and much more. When we arrived, there were 10 jeeps in front of us. We quickly branched off and found out own paths to explore. One thing to know about safaris is that you can’t leave the jeep. It’s safer for you and the animals to stay inside at all times. Another thing that you should know, is that the bathrooms are far and few between. A safari can last 4 hours, and it can take an hour to reach a bathroom, depending where in the park you are. Don’t drink too much water! The park itself closes at 6pm. 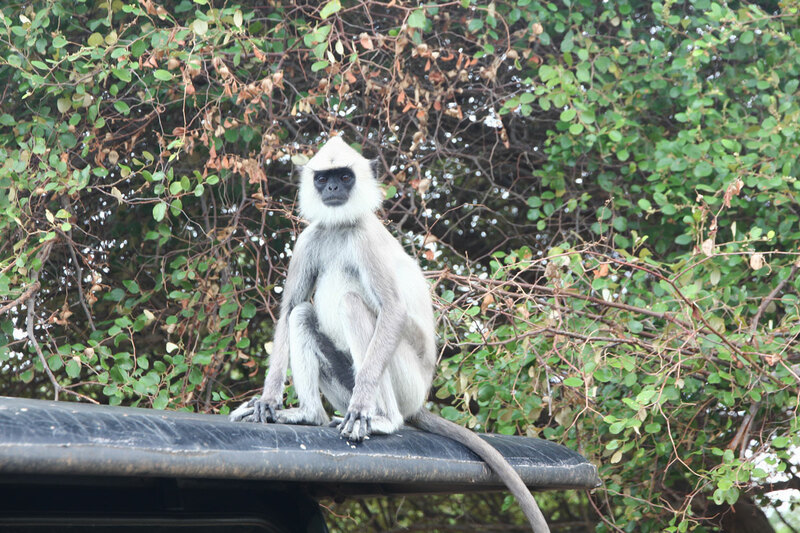 The first animals that we saw were a family of gray langur monkeys sitting on the jeep filled with a family, much to their delight. 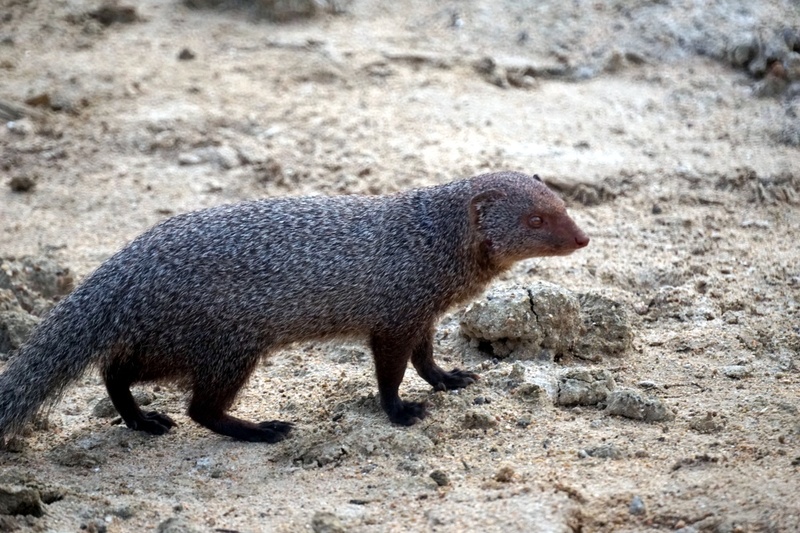 As we journeyed through the park, we encountered exotic birds, a crocodile, a mongoose, and other animals. After a little while we came across what I was waiting for- a herd of elephants hiding in the trees! We were able to get fairly close, but were careful not to disturb them. 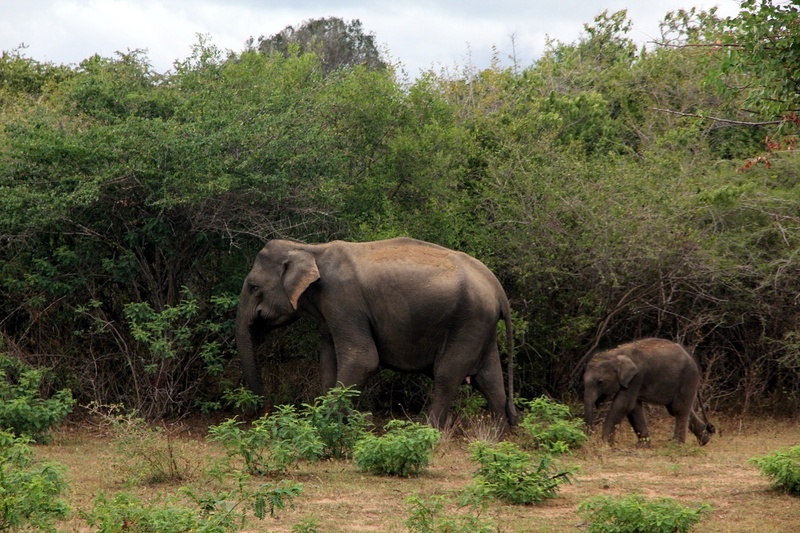 My favourite pair was this mother and baby elephant. 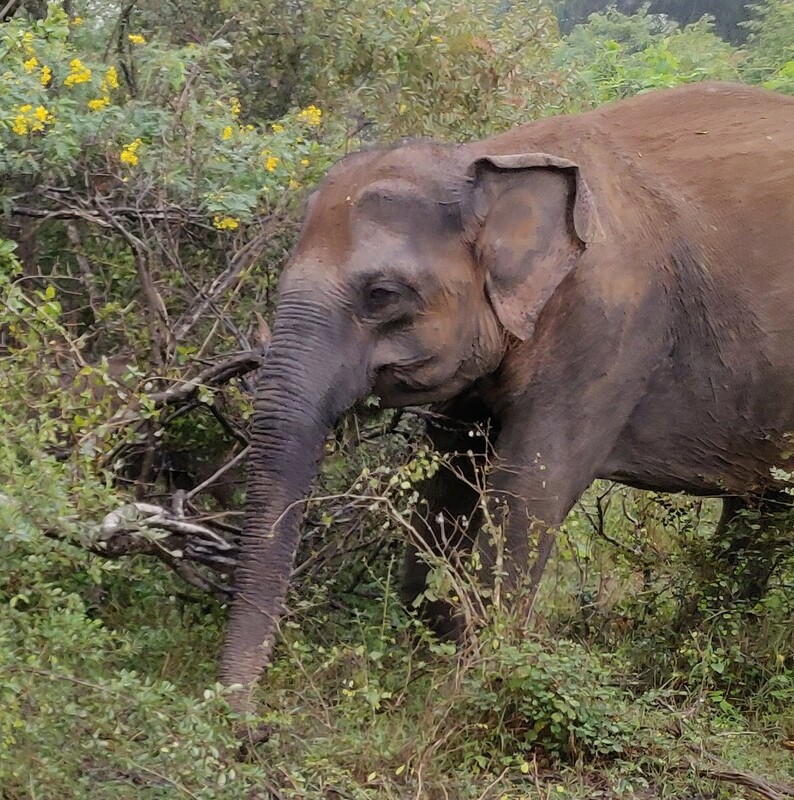 After a few hours of seeing animals in their natural habitat, and flying down dirt paths in the park, we finally head back to Yala Sanctuary. 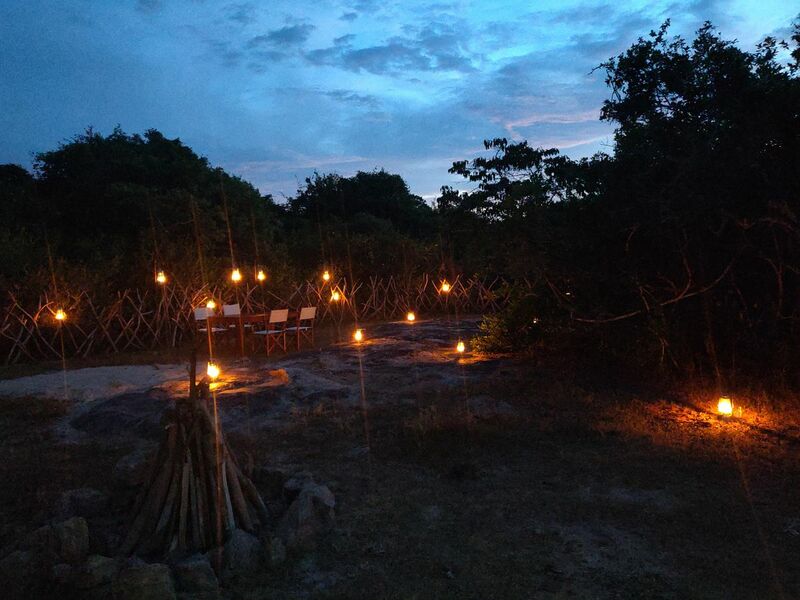 The staff had set up a romantic tiki torch lit table for us to enjoy dinner under the stars. It was a gorgeous night, and perfect experience. The meal was fantastic. 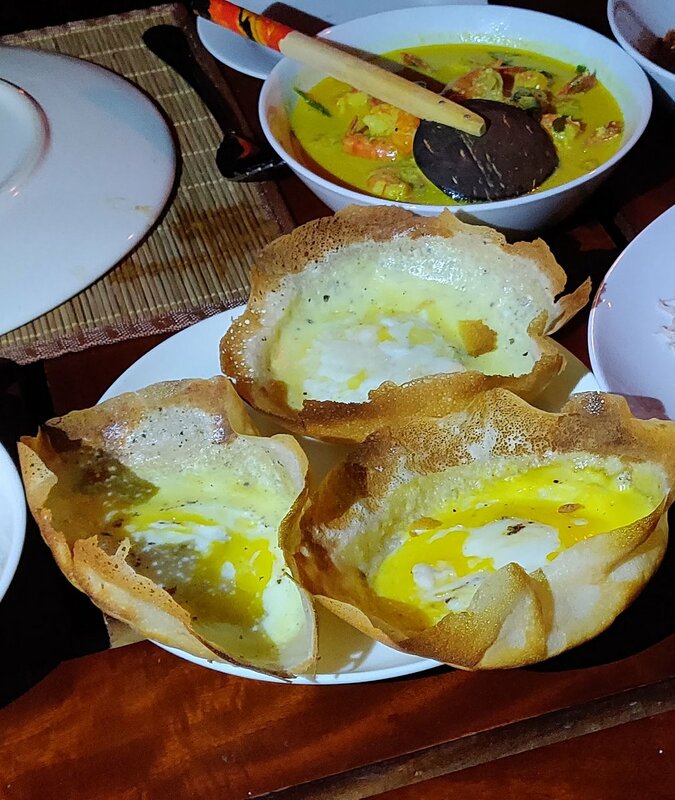 Shrimp curry, coconut roti, eggs hoppers, plain hoppers, string hoppers, and a tasty vegetable soup. 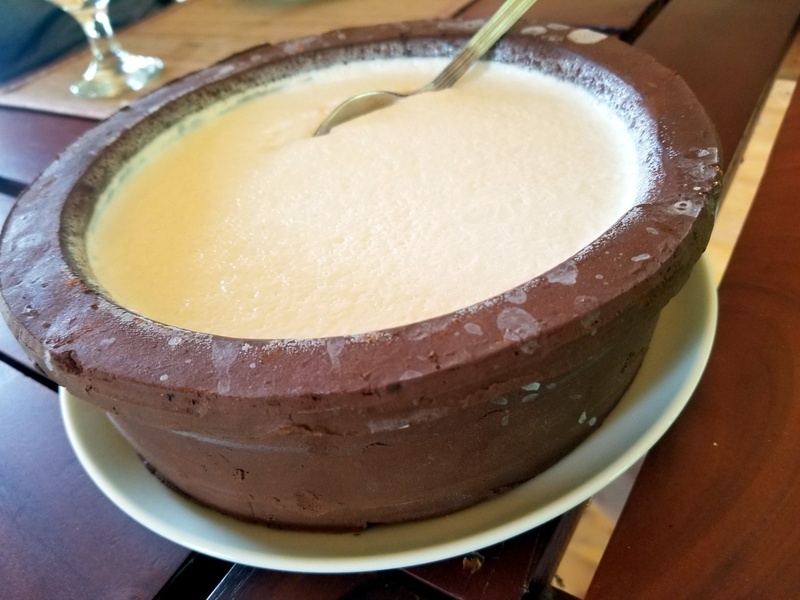 The shrimp curry was the best that I had during my trip in Sri Lanka. Mmm. As part of our visit, we had another safari scheduled for the next morning. 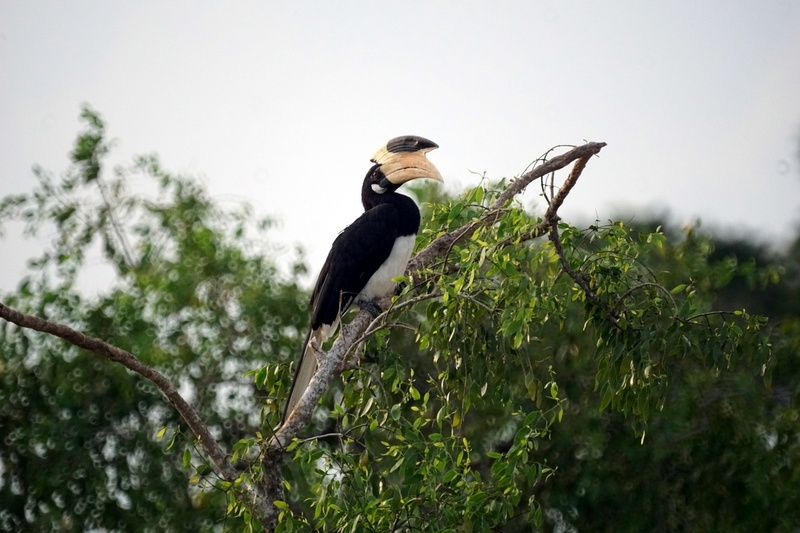 Dinesh gave us the option to up the ante, and asked us if we wanted to head out on an early morning safari. We couldn’t pass up the chance, and agreed. We would leave at 4am. I was a little nervous stay overnight in a tent in the middle of the jungle. I was a tiny bit worried that a scorpion or poisonous snake might make its way into my tent. I’m happy to report that this didn’t happen! I had a relaxing and comfortable night. (The only bugs I saw were a couple of small spiders). In the blink of an eye, it was time to wake up for the safari. Dinesh had fruit, biscuits and fresh tea waiting for us at 4am. It was much appreciated! We hopped in the safari vehicle and headed to the park. We were first in line to enter the park! It was amazing to be in the park while all the animals woke up. 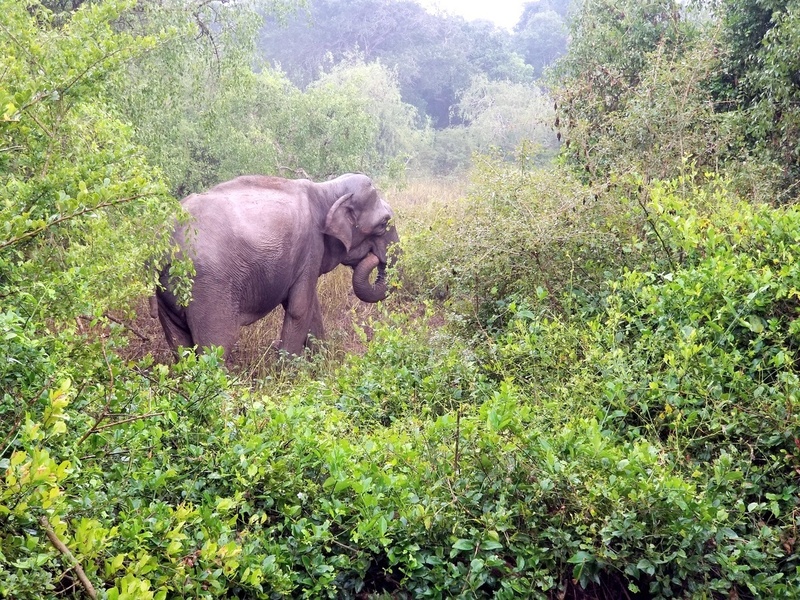 We didn’t end up seeing a leopard, but we came across tons of elephants, including a rare tusked elephant. When we got back to the tent, I took a refreshing outdoor shower. It was so relaxing, I wish I had one at home! 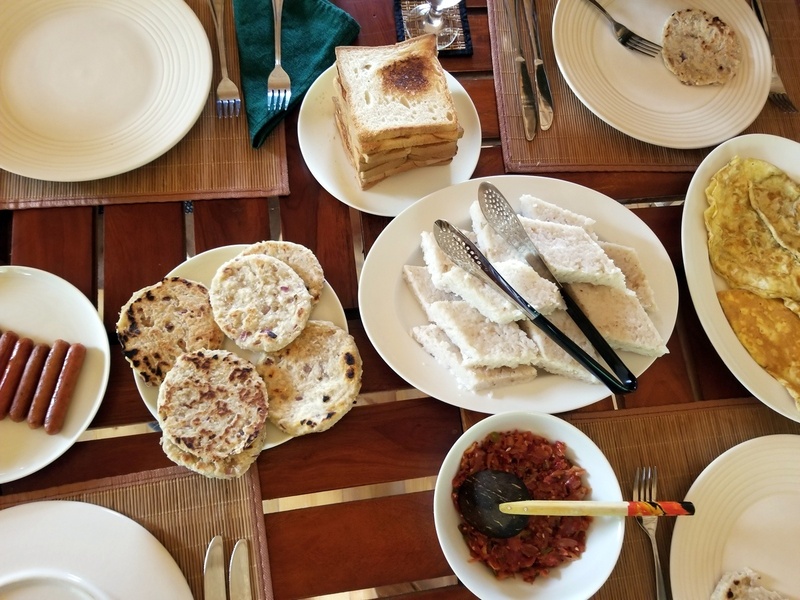 Dinesh served us another amazing meal featuring traditional Sri Lankan dishes for breakfast. 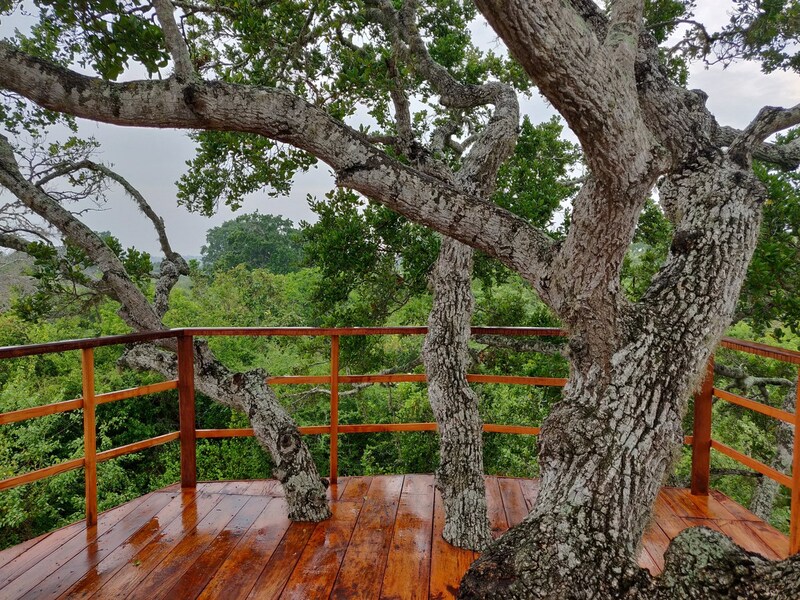 There’s a gorgeous secret tree house that’s part of the property. 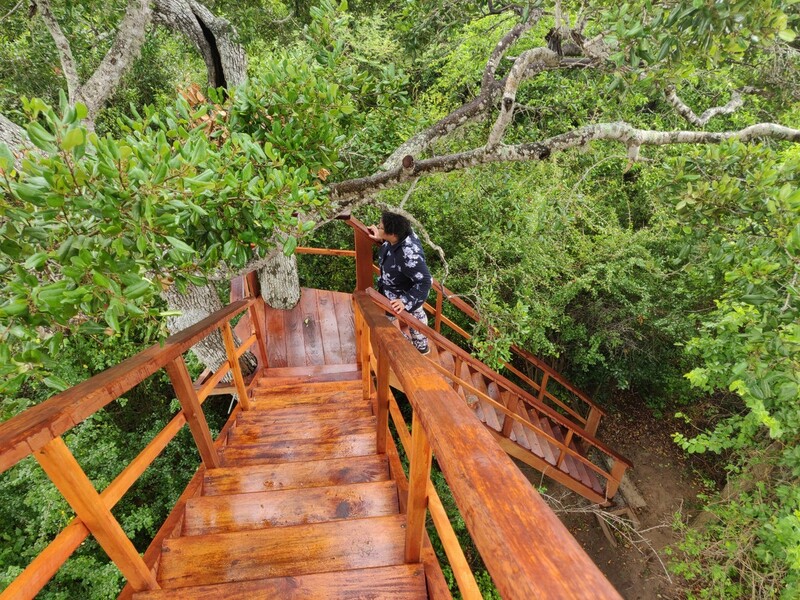 Unfortunately, we didn’t have breakfast in the tree house because it was raining. All of us were sad to check out of Yala Sanctuary. It was a once in a lifetime trip, and our favourite place that we stayed while in Sri Lanka. 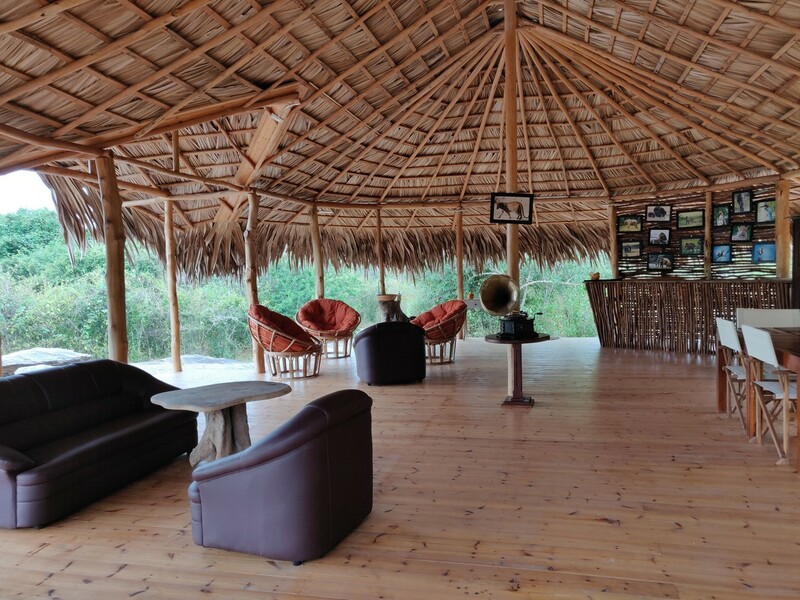 If you want an authentic experience, and are heading to Sri Lanka, please visit Yala Sanctuary. You have to stay there! To see the Instagram story of my visit, click here.